8. No 2012/2013/2014/2015/2016/2017 Brewfest Stein? Brewfest is the World of Warcraft counterpart of the famous Oktoberfest, the largest faire in the world, held every year in Munich, Germany. As its name suggests, the event consists in a virtual celebration of fictional World of Warcraft beers. Alcohol being a central theme in Brewfest, the event is very slightly different on the European realms. This was necessary for the game to keep its PEGI 12 rating. The event itself takes places outside of Ironforge if you play Alliance or Orgrimmar if you play Horde. Many rewards can be earned: mounts, epic gear, pets, achievements, a title, and vanity items. This guide will walk you through everything you need to know to complete the event. The 2018 version of the event brings updated loot from Coren Direbrew (item level 335 this year). In addition, the Brewfest Garb can be used for transmogrification for the duration of the event and low levels can queue for Coren. killing Coren Direbrew in Blackrock Depths, which has a chance to reward a vanity item, mounts, and epic gear. Achievements can be earned while doing daily quests, when killing Coren Direbrew, or by purchasing specific items with tokens. The currency used during Brewfest is Brewfest Prize Token. As the tooltip states, the tokens require Brewfest and will disappear when the event ends. This means that they cannot be kept from one year to the other. Brewfest Prize Tokens used to be an alternative currency. As such, items purchased with these tokens could previously be refunded, which made it easy to get some achievements as one could simply buy a required item to obtain the related achievement before refunding the item. Since Brewfest 2010, Brewfest Prize Tokens are no longer an alternative currency and items bought with them can no longer be refunded. Brewfest usually takes place around the same time as Oktoberfest, its real world counterpart. This year, Brewfest will start on the 20th of September and will end on the 6th of October. There is no progression through the event, each day brings you the same daily quests that were available from day 1. Completing all the achievements and collecting all the rewards will take a varying amount of time, depending on your skill at collecting tokens. In average, it takes 8 to 10 days. Buying the remaining toys and vanity items takes, in average, 7 to 9 more days. As we explain in the Keg Run section, the number of Brewfest Prize Tokens you can earn in a given day vary according to your ability to perform a specific assignment. On the first day, you can earn (approximately) between 135 and 165 tokens. On subsequent days, you can earn between 35 and 65 tokens. To complete the event, you need to spend between 750 and 770 tokens (depending on whether you get a mount from Coren Direbrew or not). To buy the remaining vanity items, you need to spend another 600 tokens. As you can see, the 2-week duration of the Faire is not enough to get all the rewards available. The rewards offered by Brewfest are detailed in this section. At 6:15 AM and 6:15 PM, you can witness the Tapping of the Keg ceremony at the event locations, outside Orgrimmar or Ironforge. Doing so will grant you Brewfest Enthusiast, which increases your experience earned by 10% for 2 hours. Pandaren Brewpack, for 100x Brewfest Prize Tokens. In addition, Keiran Donoghue (Alliance) and Bron (Horde) sell Gravil Goldbraid's Famous Sausage Hat for 100x . Direbrew's Remote has a chance to drop from Coren Direbrew. Prior to Brewfest 2010, this item used to be very useful for teleporting your group to Coren Direbrew, in Blackrock Depths. Coren is now only accessible by queuing in the Dungeon Finder tool, which removes most of the appeal that this item used to have. Preserved Brewfest Hops temporarily turns your mount into a Swift Brewfest Ram if you play Alliance or into a Great Brewfest Kodo if you are Horde. The item has only one charge and will disappear after you use it. The effect lasts until you dismount. Preserved Brewfest Hops can be bought for 20 Brewfest Prize Tokens from Belbi Quikswitch if you play Alliance or from Blix Fixwidget if you play Horde. If you play Alliance, you can buy Belbi's Eyesight Enhancing Romance Goggles from Belbi Quikswitch for 100 Brewfest Prize Tokens. Equipping these goggles will make everyone look like male Gnomes. If you play Horde, you can buy Blix's Eyesight Enhancing Romance Goggles from Blix Fixwidget for 100 Brewfest Prize Tokens. Equipping these goggles will make everyone look like female Orcs. Belbi Quikswitch and Blix Fixwidget also sell the different parts of the Brewfest Garb (required for one of the achievements, Disturbing the Peace). These items can be used for transmogrification for the duration of the event. The first edition of Brewfest, in 2007, saw players be given a Yellow Brewfest Stein for participating in the event. In 2008, they received a Blue Brewfest Stein, and in 2009, a Green Brewfest Stein. Unfortunately, in 2010, no new stein was offered and this led a disappointed community to think that steins would no longer be given during Brewfest. In 2011, a new Brewfest stein was available: Overflowing Purple Brewfest Stein. This year, sadly, there is no new stein. Finally, Brewhelm, which attaches two tankards to your head item and can be bought with 2 Brewfest Prize Tokens, is sold by Belbi Quikswitch (Alliance) and Blix Fixwidget (Horde). Three pets are available to players participating in Brewfest: Pint-Sized Pink Pachyderm, Wolpertinger's Tankard, and Stout Alemental. The Pint-Sized Pink Pachyderm is bought with 100 Brewfest Prize Tokens. The Wolpertinger's Tankard is bought with 200 Brewfest Prize Tokens on European servers and is a quest reward on North American servers. The Stout Alemental is sold for 200 Brewfest Prize Tokens. The two mounts rewarded by the event are: Swift Brewfest Ram and Great Brewfest Kodo. Both have a chance to drop from Coren Direbrew, regardless of your faction. Coren Direbrew's loot tables are updated every year so that the item level of the items matches that of the current content. This year, his drops are of item level 335. Brewfest takes place in rather confined areas, in Dun Morogh (Alliance) and Durotar (Horde), inside which there are many NPCs that you will need to interact with during the event. Before we walk you through the event, we present you with maps of the respective Alliance and Horde areas and mark the locations of the important NPCs, as well as the location where the attack from the Dark Iron Dwarves (see related section below) happens. 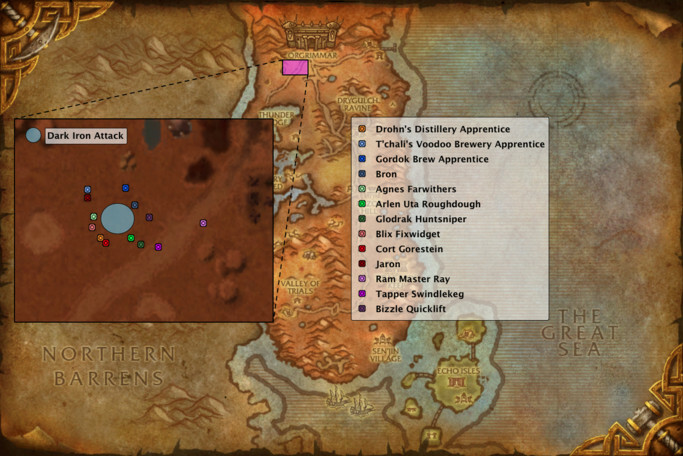 For Alliance players, Brewfest is located at the same place as usually. For Horde players, a Dranosh'ar training camp has been built where the Faire used to be. Therefore, the Horde Brewfest is now located slightly west of its former position. As is the case with many seasonal events, commoners in capital cities will offer an optional preliminary quest: Brewfest! (Alliance/Horde). Simply go to the Brewfest location and speak to the organiser: Ipfelkofer Ironkeg for Alliance players or Tapper Swindlekeg for Horde players. The organiser himself also gives the quest. Together with slaying Coren Direbrew, Ram Racing constitutes the very essence of Brewfest, i.e., this is what you will be spending most of your time doing. When accepting Ram Racing related quests (we detail them in subsequent sections), your character is mounted on a Ram and you are provided with an extra action bar button to cast Giddyup!. The first time you accept such a quest, it is strongly advised that you take a few seconds to bind a key to this action bar button. Indeed, repeatedly clicking this button to maintain the speed of the Ram and over the course of several minutes is highly uncomfortable. Exhausted Ram: 85% slower than on-foot running speed, last 15 seconds and removes 15 stacks of Ram Fatigue. spamming Giddyup! will maintain Ram - Gallop. When you arrive at Brewfest, the first quest you should do is Now This is Ram Racing... Almost. (Alliance/Horde), given by Neill Ramstein to Alliance players and Ram Master Ray to Horde players. It enables all the other Ram Racing activities. Maintain Ram - Trot for 8 seconds, this will not build any Ram Fatigue stacks. Maintain Ram - Canter for 8 seconds, this should be 8 stacks of Ram Fatigue. Maintain Ram - Gallop for 8 seconds, this should not add more than 40 stacks of Ram Fatigue, leaving you ample time to slow down before reaching exhaustion. You have 4 minutes to complete the quest. As you can see, this is more than enough. After completing the prerequisite quest, you will be given the chance, every day, to promote one of the two breweries related to your faction, by barking for them at 4 locations in Orgrimmar or Ironforge. Simply go to the designated locations, and the barking part will be done automatically. You must reach all 4 locations within 4 minutes while riding a Ram. Succeeding will reward you with 15 Brewfest Prize Tokens. Alliance players have the choice between Bark for the Barleybrews! given by Becan Barleybrew and Bark for the Thunderbrews! given by Daran Thunderbrew. Horde players have the choice between Bark for Drohn's Distillery! given by Cort Gorestein and Bark for T'chali's Voodoo Brewery! given by Ja'ron. The barking part is automatically done as you reach the designated areas. In both Orgrimmar and Ironforge, the quest is made easy by the fact that 4 minutes are alloted for completing the 4 barking objectives. Once you have completed them, you can take as long as you need to go back to the quest giver. If you have an epic ground mount or a flying mount, you can dismiss the Ram and finish the quest on your own, faster mount. The optimal Ram's usage seems to be to always remain in Ram - Canter and slow down to Ram - Trot when your stacks of Ram Fatigue get close to 100, in order to remove them. The Keg Run is the traditional name of a Brewfest daily quest, Brew for Brewfest (Alliance/Horde), given by Neill Ramstein to Alliance players and by Ram Master Ray to Horde players. It consists in driving a Ram efficiently to fetch kegs of beer from a nearby location and bring them back to Brewfest. Each delivery gives Brewfest Prize Tokens. Therefore, the faster you go, the more tokens you can gather in the alloted time. To unlock the Keg Run, you need to do the prerequisite quest: There and Back Again (Alliance/Horde), given by Neill Ramstein to Alliance players and by Ram Master Ray to Horde players. This quest serves as an introduction to the Keg Run, the only differences being that you are limited to 3 deliveries and you receive 10 Brewfest Prize Tokens for completing the quest, no matter how fast you are. For the deliveries, simply go to the designated location (Kharanos for Alliance players), where a keg will automatically be thrown to you. Note that you need to have a free inventory slot to receive the keg. Then, come back to the quest giver area to deliver the keg. You will find 4 buckets of apples along the road, which reset your Ram Fatigue when you pass very close to them. Once you have completed the prerequisite quest, you can go back to the quest giver every day to do more deliveries. He will propose you a daily quest, Brew for Brewfest (Alliance/Horde), which completes instantly if you accept it. Then, you will be mounted on a Ram and you can start the deliveries. The Ram expires after 4 minutes. Each delivery adds 30 seconds to the timer. If you are efficient, you can do deliveries in 40 seconds or a bit less, enabling you to do over 20 deliveries. Since each delivery rewards 2 Brewfest Prize Tokens, the more deliveries you do, the faster you will be able to complete the event. turn around before getting the keg or delivering it. one a bit behind the NPC that gives you the kegs. Ideally, you only want to make use of the second and third buckets. Keep the other two (those behind the NPCs) for backup purposes, for example when the second of third bucket did not reset your stacks of Ram Fatigue (it can happen). Turning around before you reach the NPCs can make you gain precious time. When you fetch the keg, you can turn around at about 20 yards from the NPC. He will still throw the keg at you and it will eventually catch up with you while you ride back to Brewfest. The same works for the delivery part, although it seems that you need to get a bit closer, around 15 yards. Below, you will find a rather optimised route for Alliance players. Aim for the third bucket on the way to the keg and for the second bucket on the way back. Next, you will find an optimised route for Horde players. 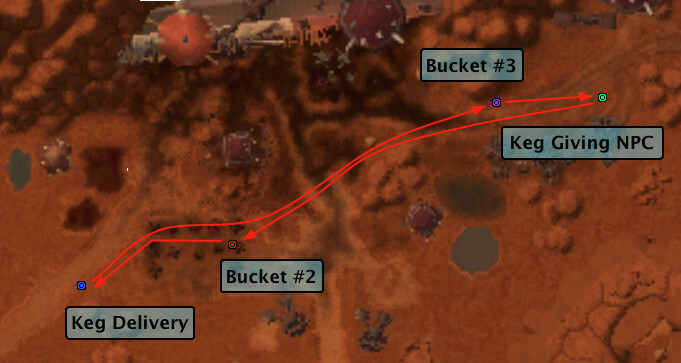 As for the Alliance Keg Run, aim for the third bucket on the way to the keg and for the second bucket on the way back. Every 30 minutes, the Dark Iron Dwarves from Blackrock Mountain use their transporter to invade Brewfest. To defend the camp, you need to drink beers and throw the empty mugs at the Dark Iron Dwarves. To get started, you should do the Chug and Chuck! quest (Alliance/Horde) given by Boxey Boltspinner to Alliance players and by Bizzle Quicklift to Horde players. This quest will train you to target enemies with a mug. Basically, you need to attack the robot located behind the quest giver's stand. Drink from a Complimentary Brewfest Sampler and the empty mug will be automatically thrown at the robot, if you are targeting it. Upon completion, this quest will reward you with 10 Brewfest Prize Tokens. Every 30 minutes, digging machines will start surfacing in the middle of the Brewfest location. Dark Iron Dwarves will then exit the machines and attempt to destroy the 3 big beer kegs nearby. To defend Brewfest, loot a mug of beer from a nearby table. Every time you empty it (by right-clicking it), your character will throw it at a random enemy. Then, the mug automatically refills and you can immediately use it again. You do not need to specifically target a dwarf, the game seems to choose a nearby target. Sometimes, NPCs will drop large mugs on the ground. Using them grants a sort of whirlwind power that takes out many Dark Iron Dwarves. After a few minutes, the dwarves will leave. If the beer kegs are still intact, the defense is successful, otherwise it is failed. It is a good idea to announce the attack in general chat, as players will usually come to help. After a successful defense, you will notice a cogwheel in the middle of the faire. It fell off one of the Dark Iron Dwarves' transports. The item offers you the This One Time, When I Was Drunk... quest (Alliance/Horde). Turning it in rewards you with 10 Brewfest Prize Tokens and the Down With The Dark Iron achievement. Note that while you can participate in the defense of Brewfest as many times as you wish over the course of a single day, you will be able to turn in the daily quest, and receive its reward, only once. Brewfest provides you with two unique pets: Pint-Sized Pink Pachyderm and Wolpertinger's Tankard. The Pint-Sized Pink Pachyderm can be bought for 100 Brewfest Prize Tokens from Belbi Quikswitch (Alliance) or Blix Fixwidget (Horde). The Wolpertinger's Tankard is obtained differently on the North American and European servers. Goldark Snipehunter (Alliance) and Glodrak Huntsniper (Horde) provide you with the two following quests: Pink Elekks On Parade (Alliance, Horde) and Catch the Wild Wolpertinger! (Alliance, Horde). The former enables you to earn extra Brewfest Prize Tokens (see next section) and the latter rewards you with the Wolpertinger's Tankard pet. Catch the Wild Wolpertinger! requires you to capture 5 Wolpertingers around Brewfest. 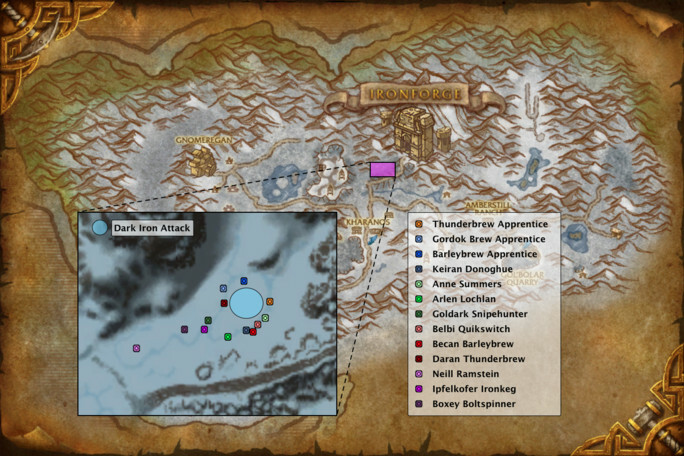 Note that Hunters and Druids can display the location of nearby Wolpertingers on their minimap thanks to Track Beasts. To see the Wolpertingers, you need to be drunk. Either drink alcoholic beverages until you see the You're feeling drunk off of... message or wear the Synthebrew Goggles that the quest giver provides you with if you ask him. To capture a Wolpertinger, simply target it and use the provided quest item ( Wolpertinger Net). Exodar: just outside of the main exit (the one facing Azure Watch). To see the Pink Elekks, you need to be drunk. Either drink alcoholic beverages until you see the You're feeling drunk off of... message or wear the Synthebrew Goggles that the quest giver provides you with if you ask him. To kill the Pink Elekks, simply target them and use the provided quest item ( Elekk Dispersion Ray). Because killing and capturing animals while being drunk is not compatible with the PEGI 12 game rating of World of Warcraft in Europe, the two quests Pink Elekks On Parade (Alliance, Horde) and Catch the Wild Wolpertinger! (Alliance, Horde) are not available to European players. European players have a 40 Brewfest Prize Tokens deficit for not being able to complete Pink Elekks On Parade. It has never been compensated in previous editions of Brewfest. The Wolpertinger's Tankard can be bought for 200 Brewfest Prize Tokens (minus reputation cost reductions) from Belbi Quikswitch (Alliance) and Blix Fixwidget (Horde). Coren Direbrew is the boss of the Brewfest event. He is located in Blackrock Depths and you can only access him through the Dungeon Finder tool. Queuing transports you directly to Coren. To engage him, talk to him, insult him, and do not apologise. The fight is relatively easy. Simply control his sidekicks and nuke him down. The first time you kill Coren, you can loot Direbrew's Dire Brew from his corpse. This item starts the Direbrew's Dire Brew quest (Alliance/Horde), which rewards 40 Brewfest Prize Tokens. The first 3 editions of Brewfest rewarded a stein vanity item that did not come back in the 2010 edition: Yellow Brewfest Stein in 2007, Blue Brewfest Stein in 2008, and Green Brewfest Stein in 2009. The 2011 edition rewarded an Overflowing Purple Brewfest Stein. These items were always the reward of an easy souvenir quest, given by Neill Ramstein's assistant (Alliance) or Ram Master Ray's assistant (Horde), to be turned in to Belbi Quikswitch (Alliance) or Blix Fixwidget (Horde). This souvenir quest was enabled by completing the Now This is Ram Racing... Almost. quest (Alliance/Horde). Sadly, this year, there does not appear to be a new stein to collect. This has been the case since 2012. Down With The Dark Iron: after successfully defending Brewfest from the Dark Iron Dwarves' attack and turning in the related daily quest for the first time. In the remainder of this section, we will walk you through the achievements that you still need to complete. Fresh Brewfest Hops: this item, which you can only keep during Brewfest, costs 2 Brewfest Prize Tokens and transforms your mount into a Brewfest Ram (Alliance) or a Brewfest Kodo (Horde). Fresh Goblin Brewfest Hops: this item, which you can only keep during Brewfest, is only available to Alliance players, costs 5 Brewfest Prize Tokens, and transforms your mount into a Brewfest Kodo. Fresh Dwarven Brewfest Hops: this item, which you can only keep during Brewfest, is only available to Horde players, costs 5 Brewfest Prize Tokens, and transforms your mount into a Brewfest Ram. Preserved Brewfest Hops: this item, which you can keep even after Brewfest is over, costs 20 Brewfest Prize Tokens and transforms your mount into a Brewfest Ram (Alliance) or a Brewfest Kodo (Horde). All of these items have only one charge and will disappear after being used. The temporary decoration they grant to your mount will expire when you dismount. A Brew-FAST Mount simply requires you to kill Coren Direbrew at least once a day, hoping to get a Keg-Shaped Treasure Chest containing Great Brewfest Kodo or Swift Brewfest Ram. Drunken Stupor is the drunk version of Going Down?. Simply go back to the location you used for Going Down?, drink alcoholic beverages until your character is smashed, then jump. Strange Brew (Alliance / Horde) requires you to buy and taste various beers (each for less than 4 ) from different vendors located at Brewfest. The objectives of the achievement differ between Alliance and Horde. The beverages disappear from your inventory and your mail when Brewfest ends. The Brewfest Diet requires you to buy and taste Brewfest food (each for less than 15 ) from various vendors located at Brewfest. The food items disappear from your inventory and your mail when Brewfest ends. Secondly, you need go to Dalaran, wear the 3 pieces of the Brewfest Garb, get as drunk as you possibly can, before finally using the /dance emote. With 200 Brewfest Prize Tokens, you can buy the "Brew of the Month" Club Membership Form (Alliance / Horde) from your Brewfest vendor, Belbi Quikswitch (Alliance) or Blix Fixwidget (Horde). This item starts Brew of the Month Club (Alliance / Horde). Completing this quest will make you join the Brew of the Month Club and will complete the Brew of the Month achievement. Sampling all these beers (it indeed takes a year) grants you the Brew of the Year achievement. We hope that this guide will have answered every question you had about Brewfest. If not, we encourage you to leave a comment or contact us by e-mail, we will be happy to address the issue you encountered. Because of the Cataclysm, a few things changed since the last edition of Brewfest. We did the necessary testing to ensure that the guide properly takes them into account. 20 Sep. 2018: 2018 update. 22 Sep. 2017: 2017 update. 20 Sep. 2016: 2016 update. 20 Sep. 2015: 2015 update. 23 Sep. 2014: Fixed explanations for Keg Run quests, because the quest item has been removed and replaced by an extra action bar button.